3. Direction indicators (PY21W amber). 4. Sidelamps (light emitting diodes - LEDs). 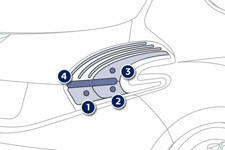 For replacement, contact a PEUGEOT dealer or qualified workshop. To reassemble, carry out these operations in reverse order. 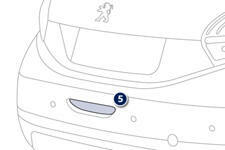 Take care to engage the lamp unit in its guides, while keeping it in line with the vehicle. Tighten sufficiently to ensure sealing, but without damaging the lamp. 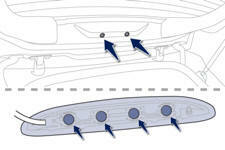 Unscrew the fixing pins on each side of the lamp, without removing them completely. Push on the screws to unclip the lamp. Remove the lamp from the outside. 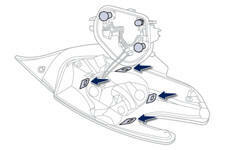 Turn the bulb holder which corresponds to the faulty bulb one quarter of a turn and remove it. To refit, carry out these operations in reverse order. 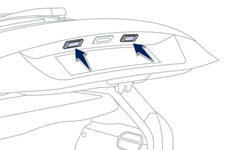 To facilitate the removal of the lamp, carry out this operation with the tailgate half open. Insert a thin screwdriver into the lens cutout. To refit, press on the lens to clip it in place. 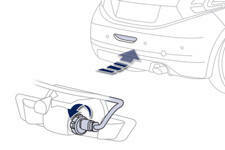 Access is by passing a hand under the bumper. Turn the bulb holder a quarter of a turn and pull it out. Disconnect the connector on the bulb holder. 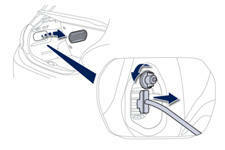 You can also contact a PEUGEOT dealer or a qualified workshop for the replacement of these bulbs.